Age-related changes in the organs – including the liver and kidneys – slow down the body’s elimination of alcohol. Older adults have less water in their bodies, so alcohol is less diluted in their bloodstream than in a younger person’s. Older adults also have less muscle to absorb alcohol, so blood alcohol concentration stays higher for longer. 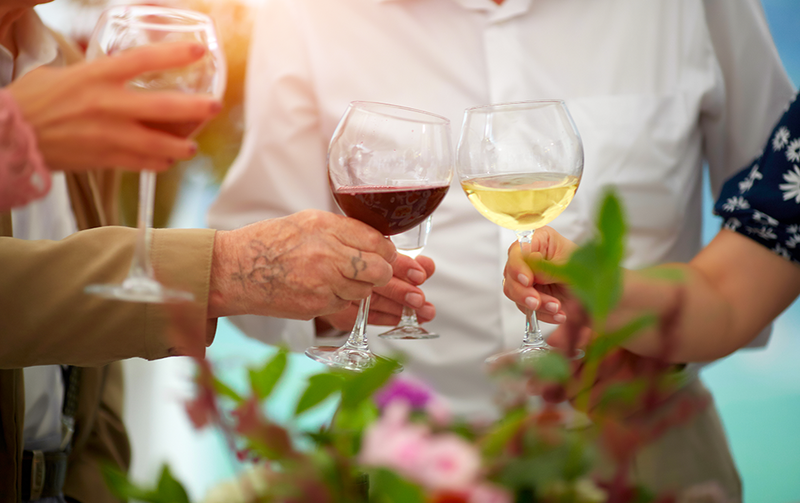 Combined with other physical changes of aging – such as diminishing vision and hearing, reduced mobility and slower reflexes – drinking alcohol can increase a senior’s risk of balance problems, falls, injuries and driving accidents. Let’s look at other reasons why it’s important to pay attention to your alcohol consumption or that of your senior loved ones. Seniors are the age group most likely to take medications. Many seniors take multiple medications daily – in Canada, one in four seniors has 10 or more prescriptions. Even a small amount of alcohol can cause an adverse drug reaction, and problems can happen even if medications and alcohol are not consumed at the same time. If you or a senior loved one takes medication – including any over-the-counter drugs and supplements – ask a pharmacist or physician about potential interactions with alcohol. Symptoms such as fatigue, drowsiness, balance problems or confusion are often assumed to be part of aging, but an adverse drug reaction could be to blame. Alcohol has been linked to many health conditions, and the more you drink, the greater your risk. For example, drinking alcohol can, over time, increase a person’s risk of certain cancers, hypertension (high blood pressure), liver disease, dementia, diabetes, heart disease and stroke. Alcohol can also worsen some health problems, including stomach ulcers, diabetes, anemia, osteoporosis, depression, dementia, gout and others. According to CAMH, women develop alcohol-related health problems sooner than men do, because women have smaller bodies, they have less water in their bodies, and they take longer to metabolize alcohol. To reduce the risk of long-term health effects, Canada’s Low-Risk Drinking Guidelines advise not exceeding “10 drinks a week for women, with no more than two drinks a day most days, and 15 drinks a week for men, with no more than three drinks a day most days.” To help prevent alcohol dependency, it’s also recommended that people not drink at all at least one or two days per week. Note that the Low-Risk Drinking Guidelines were intended for the general population (ages 25 to 65) – there are no separate recommendations for seniors. Anyone who has health issues or reduced alcohol tolerance, or is taking medications with potential alcohol-drug interactions, should adjust their intake accordingly or abstain completely. Many Canadian seniors drink alcohol. According to the 2012 Canadian Alcohol and Drug Use Monitoring Survey, 72.1% of Canadians age 65 and older drank alcohol in the previous 12 months. The survey also found that 8.4% of Canadian seniors exceeded the limits in the Low-Risk Drinking Guidelines. Experts believe that problem drinking among seniors is underestimated. Sometimes, the warning signs of alcoholism (such as fatigue, insomnia, irritability, incontinence, blurred vision, dry mouth, forgetfulness and frequent falls) are misinterpreted as normal aspects of aging or as symptoms of a health condition. Sometimes, family members and friends suspect problem drinking but are reluctant to raise the topic with their loved one. Older adults may increase their alcohol intake to cope with isolation, loneliness, depression or grief after losing a loved one. Some people do not adapt well to retirement – their working life may have been their main source of purpose and social interaction. It is estimated that, among seniors who engage in high-risk drinking, one-third developed a drinking problem after the age of 60, often because of difficulty adapting to life-changing events such as retirement, health issues, the need to rely on others for assistance, moving out of a family home and into supportive care, and the death of friends and spouses. If you are concerned about your own alcohol intake, or that of a senior loved one, seek advice from a physician about different treatment options. Depending on your relationship with your loved one, you may want to discuss your concerns with them directly; however, they may deny or downplay their drinking. Encourage them to seek treatment – the consequences of excessive alcohol consumption can be devastating to a person’s well-being.